Key terms: challenge; HCV; immunity, adjuvant, capsid. Hepatitis C virus (HCV) is a leading cause of chronic liver disease, with over 170 million people infected worldwide. Complications cirrhosis, hepatic decompensation, and hepatocellular carcinoma (Strader et al., 2004). To date, there is no effective vaccine against HCV infection and current therapies are not optimal (Pol and Bourliere, 2006). Thus, prophylactic and therapeutic approaches to prevent HCV-related liver disease are urgently needed. HCV is a member of the genus Hepacivirus, belonging to the family Flaviviridae. The viral genome is a single positive-stranded RNA encoding for a large polyprotein (Choo et al., 1989). Among the viral structural proteins, the core protein (HCcAg) is considered the main protein component of nucleocapsids. Remarkably, HCV not only exists as enveloped virions but also as free, non-enveloped nucleocapsids in the sera of HCV infected patients (Ishida et al., 2001, Maillard et al., 2001). The immunologic correlates of protective immunity, viral clearance and liver damage are not fully understood. The role of neutralizing antibodies in protective immunity against HCV infection is still uncertain (Zeisel et al., 2007, Dreux and Cosset, 2007). However, the envelope protein E2 is believed to contain important neutralizing epitopes (Youn et al., 2005). On the other hand, studies in humans and chimpanzees have indicated that failure to genérate broad-specific cellular immune responses against HCV in the acute phase of infection is associated with chronicity (Timm and Roggendorf, 2007, Rushbrook et al., 2007). Indeed, multi-epitopic HCV-specific antiviral CD8+ and CD4+ T cell responses with a T helper 1 (Thl) profile of cytokine production has been reported in patients with self-limited infection (Lechner et al., 2000, Thimme et al., 2001, Gramenzi et al., 2005). Thus, the ability to mount an efficient cellular immune response has been proposed as an important mechanism involved in the control of HCV infection, whereas a defect of such responses leads to the chronic stage (Neumann-Haefelin et al., 2007). Therefore, a candidate HCV vaccine should mainly prime broad HCV-specific T helper (Th) and cytotoxic T lymphocytes (CTL) responses (Shiina and Rehermann, 2006). One of the challenges facing the development of HCV vaccine is their extensive genetic variation (Moreau et al., 2008). HCcAg is among the most conserved proteins in HCV (Bukh et al., 1994) and is known to induce sensitization of both CD4+ and CD8+ lymphocytes (Lechner et al., 2000). Therefore, HCcAg could constitute an important vaccine component. Virus-like particles (VLPs) are attractive as a recombinant protein vaccine because they have proved to be efficient in generating powerful immune responses (Lechmann et al., 2001, Storni et al., 2003). Previously, it has been reported that recombinant VLPs containing a C-terminal truncated HCcAg (HCcAg. 120) induces a potent anti-HCcAg.120 immune response in mice (Álvarez-Obregon et al., 2001, Aguilar et al., 2003). These recombinant VLPs induce a Thl biased cell response (Álvarez-Obregon et al., 2001) and resemble those observed for hepatitis B virus core antigen, which induce strong mucosal immunogenicity due to their size, shape and stability, enabling antigen sampling and transport by M cells from nasopharyngeal epithelium to immune-inductive lymphoid tissues (Whinter and Innes, 1994, Aguilar et al., 2003). However, these VLPs contain bacterial nucleic acids (Lorenzo et al., 2001), which are known to be strong adjuvants that induce a Thl-biased cell response (Riedl et al., 2002). Recently, it has been shown that HCcAg.120 assembles in vitro into homogeneous VLPs (HCcAg. 120-VLPs) in the absence of nucleic acids (Acosta-Rivero et al., 2005b). Interestingly, addition of nucleic acids to assembly reactions led to heterogenous VLPs formation (Acosta-Rivero et al., 2005). In the present study, we reveal the icosahedral nature of HCcAg. 120 in vitro assembled VLPs. Additionally, we characterize the immune response elicited in mice after administration of these HCcAg.120-VLPs, either alone or in combination with different adjuvants. Particularly, we have chosen Aluminum hydroxide and an oil-based adjuvant for favouring Th-2 or a balanced Th-1/Th-2 profile (Roohvand et al., 2007, Bungener et al., 2008), respectively, in order to comparatively study the ability for generating both humoral and cellular immune response against HCcAg.120-VLPs. Results presented here raise the possibility of taking advantage of particulate state and adjuvant formulation for increasing HCV core immunogenicity and avoiding or reversing any immunesuppressive effect potentially related to this antigen. Endotoxin-free HCcAg.120, in vitro assembled into VLPs of approximately 30 nm, in the absence of nucleic acids, was produced for research use up to 90% of purity as previously described (Acosta-Rivero et al., 2005b). Particulate recombinant small surface antigen of hepatitis B virus (HBsAg) was produced with more than 95% of purity (Aguilar et al., 2003) at the CIGB production facilities (CIGB, Cuba). The following peptides (A1, A2 and A3), corresponding to HCcAg sequence from a Cuban isolate genotype Ib, were used for in vitro studies. Peptide Al, (aa 5-35) PKPQRKTKRNTNRRPQDVKFPGGG QIVGGVY; Peptide A2, (aa 51-70) KTSERSQPRGRRQPIPKVRR; Peptide A3, (aa 110-131) TDPRRRSRNLGKVIDTLTC GFA. These peptides were produced by the Department of Peptide Synthesis (CIGB, Ciudad de La Habana, Cuba). Human sera have been previously employed (Álvarez-Lajonchere et al., 2002). Briefly, 129 patient's sera serologically positive to third-generation HCV enzyme immunoassays and positive for HCV RNA in serum by Reverse-Transcription Nested Polymerase Chain Reaction (RT-PCR) were used. In addition, 68 sera negative for HCV markers were used as negative control. All sera were negative for markers of hepatitis B virus (Tecnosuma International, Havana, Cuba). The recombinant vaccinia virus vvCore (HCcAg-vaccinia), containing the gene-fragment coding for the first 176 aa of the HCcAg, has been previously described (Álvarez-Lajonchere et al., 2008). BALB/c (H-2d) female mice of 6 to 8 weeks old , 18-20 g of weight, were purchased from CENPALAB (Ciudad de la Habana, Cuba) and used for all in vivo evaluations. Maintenance and studies in mice were carried out according the Guiding Principies in the Care and Use of Laboratory Animals , endorsed by the American Physiological Society. HCcAg. 120-VLPs were used to induce specific immune responses in mice. Three groups of ten mice each were immunized intramuscularly (i.m.) as follow: Group 1 was i.m. immunized with phosphate-buffered saline solution (PBS) (0.1 M NaCl, 2 mM KC1, 10 mM Na2HP04, 1 mM KH2P04 pH 7.4) (control group), Group 2 was i.m. immunized with 5 µg of HCcAg. 120-VLPs in PBS, Group 3 was i.m. immunized with 50 µg of HCcAg.120-VLPs in PBS. All groups were boosted at 14 and 28 days after primary immunization. Delayed type hypersensitivity (DTH) response was assayed 21 days after the last immunization. On the other hand, five groups of ten mice each were immunized either i.m. or intranasally (i.n.) as follow: Group 1 was i.m. immunized with 10 µg of HCcAg.120-VLPs in PBS, Group 2 was i.m. immunized with 10 µg of HCcAg. 120-VLPs adsorbed (1:40, w/w) to Aluminum hydroxide (Alhydrogel®, Superfos Biosector, Kvistgard, Denmark), Group 3 was i.m. immunized with 10 µg of HCcAg.120-VLPs formulated (1:1, volume/volume) with Montanide ISA888 (SEPPIC, París, France), Group 4 was i.n. immunized with 10 µg of HCcAg. 120-VLPs in PBS, Group 5 was i.m. immunized with Montanide ISA888 (control group). In addition, groups of ten mice each, were immunized i.m. as follow: Group 1 was immunized with 10 µg of HCcAg. 120-VLPs in PBS, Group 2 was immunized with 10 µg of HCcAg.120-VLPs mixed with Montanide ISA888, Group 3 was immunized with Montanide ISA888 (control group). All groups were boosted at 14 and 28 days after primary immunization. Serum samples were taken before immunization and on day 42 by retro-orbital punction. Splenocytes were isolated on day 42. DTH response induced by HCcAg.120-VLPs was assayed by the footpad-swelling test 21 days after the third immunization, essentially as previously described (Acosta-Rivero et al., 2004). 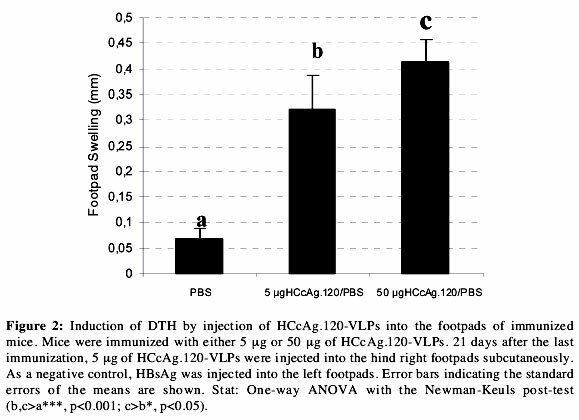 Briefly, ten mice were injected with 5 µg of HCcAg.120-VLPs into the right footpads. As a negative control, HBsAg was injected into the left footpads. The swelling response was measured using a calliper (Mitutoyo, Kawasaki, Japan) 72 h after injection. The results are expressed as the mean difference between the measures in right and left footpads. The 96-well microtiter plates (Costar, Cambridge, USA) were coated with 100 µL of HCcAg.120-VLPs (10 [Ag/mL) diluted in coating buffer (50 mM carbonate buffer, pH 9.6) at 4°C overnight. After three washes with PBS containing 0.05 % Tween 20 (PBST), the wells were blocked with 100 µL of PBST containing 1 % skim milk at room temperature for 1 hour. Wells were washed three times with PBST and received 100 µL of either mice or human sera at serial two-fold dilutions (1:50 up to 200,000) in PBST. The plates were incubated at 37°C for 1 hour. Subsequent steps were performed as previously described (Álvarez-Obregon et al., 2001). In the particular case of IgGl or IgG2a subclass determination, two specific biotynilated monoclonal antibodies for IgGl and IgG2a (Amersham, Little Chalfont, UK) were used at 1: 3,000 dilution. After one-hour incubation, a second conjúgate of streptavidine and peroxidase (Amersham, UK) was used at 1:3,000 dilution in 100 uL. 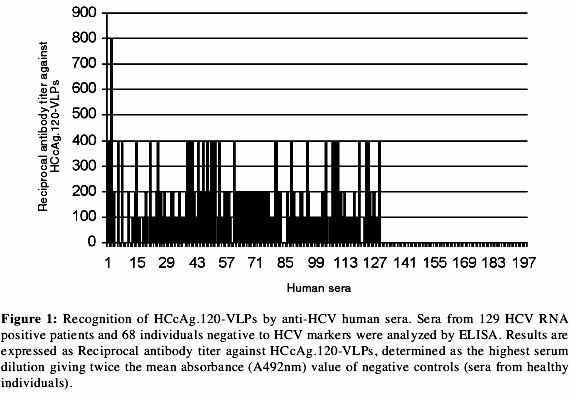 The antibody titers against HCcAg.120-VLPs are determined as the highest serum dilution giving twice the mean absorbance (A492nm) value of negative controls (either control mice sera or sera from healthy individuals ). Lymphoproliferation assay was carried out as described previously (Álvarez-Obregon et al., 2001). Briefly, pools of spleen cells from five immunized mice per group were cultivated in triplicate by using 96-well round-bottom plates at 2x105 cells per well in 200 µL of RPMI-1640 containing 10% heat-inactivated fetal calf serum (FCS), 2 mmol/liter L-glutamine, 50 units/mL penicillin, and 50 µg/mL streptomycin. Cells were stimulated with 5 µg/mL of HCcAg.120-VLPs in triplicate. As negative controls, effector cells were stimulated with either recombinant HBsAg or médium alone. Concanavalin A (5 µg/mL) was used as positive control. After stimulation for 5 days, [3H]thymidine was added (1 µCi/well). Cells were incubated for an additional 10 hours and the [3H]thymidine incorporation into DNA was measured after harvesting the plates. Lymphocyte stimulation index (SI) was calculated as the mean counts per minute (cpm) measured after antigen stimulation divided by the mean cpm of cells incubated with HBsAg. A SI ≥ 3 was considered as positive. Splenocytes from non-immunized mice were analyzed as controls, and they all showed a SI <1.5. levels of interleukin 4 (IL-4) and interferon gamma (IFN-γ ) in spleens cells from three immunized mice per group were determined with commercial kits from R&D Systems (Minneapolis, MN, U.S.A.), following the manufacturer's specification, as previously described (Dueñas-Carrera et al., 2002). The detection thresholds of IL-4 and IFN- 7 were 7.8 and 9.4 pg/ml, respectively. Splenocytes were stimulated with 5 µg/mL HCcAg.120-VLPs. Concanavalin A (5 µg/mL) was used as mitogen for positive control of stimulation. 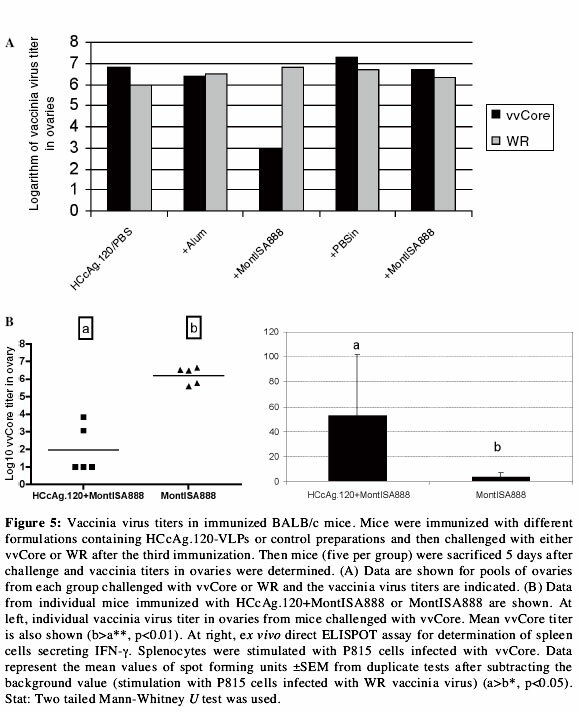 To examine antiviral immunity, five immunized BALB/c mice per group were infected intraperitoneally (i.p) with 106 plaque-forming units (pfu) of either vvCore or WR strain of vaccinia virus one week after the last immunization. Five days later, ovaries were collected and the vaccinia titers were determined on BSC-40 cells as previously described (Álvarez-Lajonchere et al., 2006). ELISPOT assay for detecting IFN-γ secreting cells specific for HCV core epitopes has been previously described (Dueñas-Carrera et al., 2002). Here, nitrocellulose-backed 96-well plates (MAHA S45; Millipore, Bedford, MA, USA) were coated with 100 µL of 5 µg/mL murine IFN-γ -specific mAb R46A2 (Pharmingen, San Diego, CA, USA) overnight at 4°C, washed three times with PBS and blocked using complete médium at 37°C for 1 h. Freshly isolated splenocytes from five immunized mice per group (2x105 to 106) were added to the wells in duplicates and stimulated with inactivated (25 µg/mL of mitomycin C (Sigma) for 30 min at 37°C) 105 of P815 cells infected for 1 hour at 37°C with vvCore at a multiplicity of infection (m.o.i.) of 10. As negative control, inactivated (mitomycin C treated) 105 P815 cells infected with WR vaccinia virus were added, and as a positive control, Concanavalin A (Sigma-Aldrich) was added at a concentration of 5 µg/mL. Cells were incubated for 20 h at 37°C in 5% C02. The plates were washed three times with PBS and five times with 0.05% Tween 20 in PBS (PBST), and then 0.5 µg/mL of secondary biotin-conjugated antibody XMG1.2 (Pharmingen) was added and reacted at room temperature for 2 h. The wells were washed five times with 0.05% PBST and peroxidase-labelled streptavidine (Sigma) was added at a dilution of 1:1,000 for 1 h. The wells were washed again with 0.05% PBST and PBS and the spots were developed by adding 3,3'-diaminobenzidine (3,3',4,4'-tetraaminobiphenyl) tetrahydrochloride (Sigma) in 50 mmol/L Tris-HCl, pH 7.4, with 0.3% H202. After 15 min the wells were washed with tap water, dried and spot counted using a dissection microscope. The numbers of antigen-specific SFU per well were calculated by subtracting background values (stimulation with P815 cells infected with WR vaccinia virus). To compare differences among groups, a One-way ANO VA with the Newman-Keuls post-test or Kruskal-Wallis non-parametric statistic test with Dunn's Múltiple Comparison Test as post-test were used. To compare differences between two groups the Mann-Whitney U test (two-tailed) was employed. P<0.05 was considered significant. 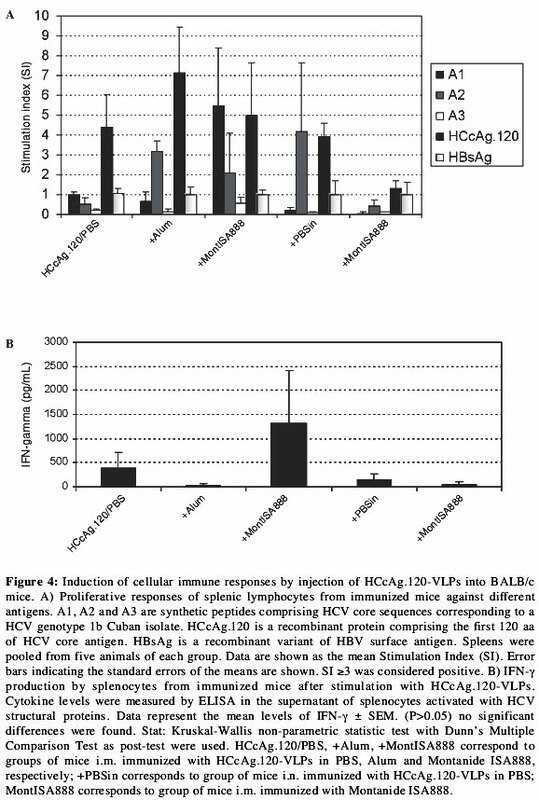 The capacity of HCcAg.120-VLPs to react with anti-HCV antibodies present in serum from individuals infected with HCV was then analyzed (Figure 1). 119 out of 129 (92.2%) sera from HCV-infected patients showed specific reactivity against HCcAg.l 20-VLPs. On the other hand, 68 out of 68 (100%) sera from healthy individuals were not immunoreactive against HCcAg.120-VLPs. As shown in Figure 2, HCcAg.l 20-VLPs induced a DTH response specific for HCcAg.120. This DTH response was higher in mice immunized with 50 µg of HCcAg.l 20-VLPs than in those immunized with 5 µg of the recombinant protein. Antigen specificity of the swelling reaction was tested in PBS immune mice, where no swelling was induced after injection of HCcAg.120-VLPs. Specific antibodies induced by HCcAg.120-VLPs were also explored by the evaluation of the major IgG subclasses in sera for all the groups in volved in the experiment. A statistically significant improvement in the HCcAg.120-specific serum IgGl titers was observed in mice i.m. immunized with HCcAg.120-VLPs+Montanide ISA888 compared to mice i.n. immunized with HCcAg.120-VLPs/PBS (Fig 3B, p<0.05, Kruskal-Wallis non-parametric statistic test with Dunn's Múltiple Comparison Test as post-test). However, no significant differences were observed among i.m. immunized groups of mice. Interestingly, the HCcAg.120+Montanide ISA888 formulation induced the highest anti-HCcAg.120 IgG2a response (Fig 3C p<0.05, Kruskal-Wallis non-parametric statistic test with Dunn's Múltiple Comparison Test as post-test). As shown in Figure 4A, HCcAg.120-VLPs immunization induced proliferative responses specific for HCcAg.120 in all immunized animals . However, no lymphoproliferative response was observed in the control group. Responses were independent of the type of adjuvant used or the inoculation route. In addition, when a control preparation of HBsAg was used to stimulate splenocytes in vitro, no proliferation was observed, indicating that the detected proliferative responses were specific for HCcAg.120-VLPs. In addition, a set of non-overlapping synthetic peptides spanning aa 5-131 of HCcAg were tested for the ability to stimulate splenocytes in vitro. Interestingly, immunization of mice by i.n. route induced a lymphoproliferative response specific for peptide A2, whereas mice immunized with HCcAg.120-VLPs/PBS by i.m. route did not show proliferative responses against any of the peptides evaluated (Fig 4A). On the other hand, mice immunized with antigen in Alum showed a similar proliferative response against peptide A2. It is interestingly to note that vaccination of mice with HCcAg.120-VLPs/Montanide ISA888 formulation induced a lymphoproliferative response against peptide Al but not against peptides A2 and A3. No proliferative responses were observed against peptide A3, possibly because part of this peptide comprises a region (aa 120-131) that is absent in HCcAg.120. On the other hand, splenocytes from BALB/ c mice i.m. immunized with HCcAg.120-VLPs either in PBS or in Montanide ISA888 were harvested after the third immunization and stimulated with recombinant HCcAg.120-VLPs as described above. Analysis of IFN-γ levels in the culture supernatants revealed that HCcAg.120-VLPs induced IFN-γ secretion specific for HCcAg.120 in 2 of 3 mice (329 and 723 pg/mL) (Fig 4B). In addition, HCcAg.120-VLPs/Montanide ISA888 formulation induced high levels of IFN-γ in 2 of 3 mice (1,811 and 2,084 pg/mL). In control-immunized animals , we detected no production of IFN-γ . On the other hand, we were able to detect IL-4 (277±31 pg/mL) only in the culture supernatants of splenocytes from mice inoculated with HCcAg.120-VLPs+Alum. When a control preparation of HBsAg was used to stimulate splenocytes in vitro, no cytokine production was observed (data not shown), indicating that responses were specific for HCcAg.120-VLPs. To asses the biological relevance of the immunity induced by vaccination with HCcAg.120-VLPs formulations, we performed challenge experiments in which either a recombinant vaccinia virus expressing HCcAg (vvCore) or WR vaccinia strain were inoculated into immunized BALB/c mice. As shown in Figure 5A, mice immunized with VLPs/Montanide ISA888 formulation showed a reduction of vvCore viral titers in their ovaries (pools of ovaries from each group). The reduction in viral titers between HCcAg.120/Montanide ISA888 and the other groups of mice was greater than log10=3 (Fig 5A). We also investigated the viral titer in pools of ovaries after challenge with WR vaccinia virus in animals immunized with HCcAg.120-VLPs either in PBS or in Montanide ISA888 compared with the corresponding negative controls. No reduction in titer of WR (>1 log10) was observed (Fig 5A). Based on these results, viral titers in ovaries from each mouse immunized with either HCcAg.120/Montanide ISA888 or Montanide ISA888 as control were determined. Remarkably, the mean viral titer in mice immunized with HCcAg.120/ Montanide ISA888 was significantly reduced as compared to that observed in control-immunized mice after vvCore challenge (Fig 5B). Furthermore, three of the five HCcAg.120/MontanideISA888 immunized mice had no detectable virus after challenge with vvCore. The other two animals in this group also had several logs of reduction in viral titers as compared with the control group (Fig 5B). As a potential model for the induction of immunity against recombinant vaccinia virus infection, it is important to show that VLPs-mediated immunization also stimulates recognition of endogenously processed viral antigens. To that end, P815 target cells were infected with vvCore. P815 cells infected with WR vaccinia virus were used as control. By using this approach a significant increase in the vvCore-specific IFN-γ producing splenocytes was obtained in HCcAg.120/ MontanideISA888 immunized mice compared with the control group (Fig 5B). HCV core antigen seems to be a relevant target in the efforts for developing therapeutic and preventive strategies against this pathogen. Previously, it has been reported that HCcAg.120 assembles in vitro into VLPs in the absence of nucleic acids (Acosta-Rivero et al., 2005b). In the present study, the presence of antibodies directed to HCcAg.120-VLPs was detected in a high percent of HCV infected patients. Three intramuscular injections of HCcAg.120 (3, 6 or 12 µg) every 21 days to BALB/c and C57BL6 mice have previously induced specific immune response (Álvarez-Obregon et al., 2001). Thus, here we evaluated two different antigen amounts, 5 and 50 µg, and a reduced interval between doses. Particularly, we tested 50 µg in order to evalúate whether the use of this relatively high amount of protein antigen increases the immunogenicity or causes a non-responsive status in animals due to T cell exhaustion, as previously described for other antigens (Martinez-Donato et al., 2007). We choose a two-week interval between doses as has been previously employed successfully for other HCV core protein variants (Harase et al., 1995). 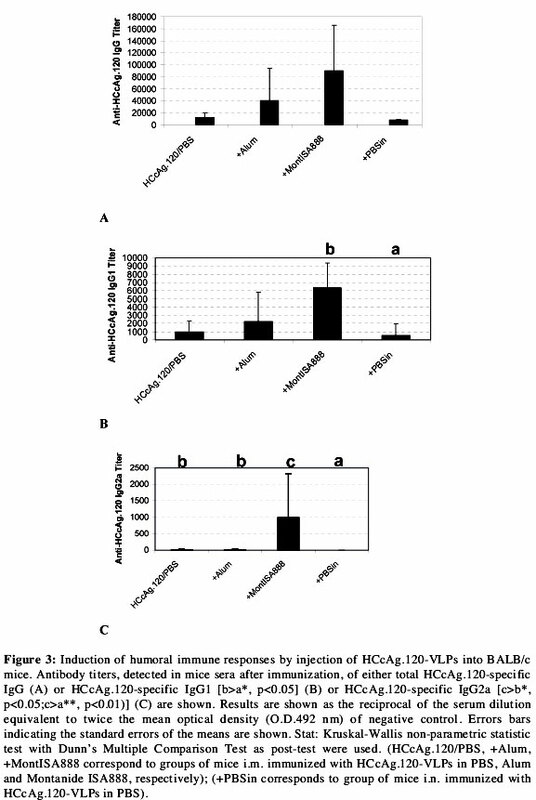 In fact, HCcAg.120-VLPs induced a strong HCcAg.120-specific humoral immune response in BALB/c mice. HCV infected patients frequently make antibodies to HCcAg (Chiba et al., 1991). These antibodies may or may not have viral neutralizing activity, since high titer anti-HCcAg antibodies can coexist with viremia (Zhang et al., 1993). Indeed, HCV not only exists as enveloped virions but also as free, non-enveloped nucleocapsids in the sera of HCV infected patients (Ishida et al., 2001, Maillard et al., 2001). Lipo-viro-particles, comprising HCV core protein, HCV RNA and lipoproteins, purified from plasma of untreated chronically HCV-infected patients, bind and enter hepatocyte cell lines, suggesting the possibility that HCV nucleocapsids could contribute to HCV infectivity in vivo (André et al., 2002). Induction of specific DTH response in vivo is mediated by antigen-specific CD4+ Thl effectors (Jin et al., 2004). Possibly, on day 21 after the last immunization, HCcAg.120-specific CD4+ Thl effectors were able to circuíate through footpad tissue, as indicated by a strong DTH to HCcAg.120-VLPs. Tfms, data suggest that HCcAg.120-VLPs immunization in BALB/ c mice leads to HCcAg.120 processing and presentation in vivo which induced an HCcAg.120-specific activated CD4+ Thl-cell response in mice. Supporting the in vivo DTH results, HCcAg.120-VLPs induced proliferative responses with a putative Thl cytokine profile after in vitro stimulation (HCcAg.120-VLPs-dependent production of IFN-γ but not IL-4). Similarly, previous studies showed the induction of both proliferative and an IFN-γ producing Thl response by HCcAg.120 immunization in BALB/c and C57 mice (Alvarez-Obregon et al., 2001, Aguilar et al., 2003). However, as those VLPs contained bacterial nucleic acids (Lorenzo et al., 2001), which are potent inducers of Thl response, the intrinsic quality of HCcAg. 120-VLPs to induce this kind of immune response remained unanswered. Data shown here provide evidence about the ability of HCcAg.120-VLPs to genérate strong cellular immune responses. Analysis of proliferation and cytokine profiles of HCV-specific T cells showed that persons showing a strong HCV-specific T-cell proliferation with increased IFN-gamma production are more likely to experience viral clearance (Rosen et al., 2002, Gramenzi et al., 2005). In addition, strong CD4+ T cell responses against HCcAg have been found to be associated with self limited infection (Botarelli et al., 1993, Missale et al., 1996). Besides, it has been shown that a strong Thl-like T cell response specific for HCcAg in HCV infected patients is related either with a benign course of the infection or with a successful immune responses against HCV (Missale et al., 1996, Lechner et al., 2000, Gramenzi et al., 2005). Therefore, our findings that HCcAg. 120-VLPs can induce proliferative responses with production of IFN-γ , and they are also able to elicit a strong DTH response against HCcAg. 120, are important features for a potentially effective HCV vaccine. Adjuvants have been used with conventional vaccines to elicit an early, robust, and durable immune response, and they can modulate the immune response toward different T-helper (Thl versus Th2) response (Cox and Coulter, 1997). Previously, HCV core protein formulated in Montanide720 (with a synergistic effect by inclusion of CpG) could induce balanced and strong Thl/Th2 responses (Roohvand et al., 2007). The higher induction of IgG2a antibodies and the tendency to obtain higher secretion of IFN-γ by cells from HCcAg.120-VLPs/ Montanide ISA888 immunized mice suggest that this formulation induce a Thl-type response in BALB/c mice. In addition, HCcAg. 120-VLPs/Montanide ISA888 immunization induced a differential epitope proliferative response (positive to Al but not to A2 and A3 peptides) regarding the other immunogens, suggesting that this formulation modulated the HCcAg.120-specific immune response in BALB/c mice. Peptides A1, A2 and A3 comprise HCV epitopes previously described in mice and humans (Harase et al., 1995, Kakimi et al., 1995, Jackson et al., 1997). Particularly, A1 and A2 comprise epitopes specific for mouse T CD4+ lymphocytes (Kakimi et al., 1995, Harase et al., 1995). Peptide Al also encompasses an epitope specific for human B lymphocytes (Jackson et al., 1997). Differential immune recognition at the T cell level for a particular peptide after immunization by different routes, like the observed for peptide A2 (i.n. vs i.m. ), could be related by the difference in cells responsible for antigen processing and presentation (Novak et al., 2004). The protective efficacy of any experimental vaccine formulation can best be analysed in an in vivo bioassay model. We tested the ability to control infection after immunization with HCcAg. 120-VLPs in a surrogate challenge model with recombinant HCcAg-vaccinia. By using this approach, it has recently been shown that immunization of BALB/c mice with HCcAg.120-VLPs, mixed with a DNA vaccine (containing the HCV structural region), induces a strong cellular immune response and specifically controlled viral infection after challenge with vvCore (Álvarez-Lajonchere et al., 2006). On the other hand, a previous study has reported that HCV-VLPs-induced immune responses protected mice from challenge with a recombinant HCV vaccinia expressing HCV structural proteins (Murata et al., 2003). Furthermore, adoptive transfer of splenocytes from immunized to naive mice conferred protection against recombinant vaccinia challenge and the selective depletion of the CD4+ or CD8+ population abolished the protective immunity (Murata et al., 2003), suggesting the critical role of both CD4+ and CD8+ effector lymphocytes for this immunity. In this work, immunization with HCcAg.120-VLPs/ Montanide ISA888 resulted in a >3 log10 reduction in vaccinia virus titer when challenged with vvCore, whereas no reduction was seen when challenged with WR vaccinia strain compared to control immunized mice. Data suggest that immunity against vvCore was mediated by the cellular immune response against HCcAg. Interestingly, there was a marked increase in the number of IFN-γ producing spleen cells in mice immunized with HCcAg.120-VLPs/Montanide ISA888 compared to control immunized mice. The ex vivo direct ELISPOT assay using the P815 mastocytome cell line infected with vvCore indicated that this formulation induces effector antigen-specific T cells (possible CD8+ cells), showing the ability to recognize naturally processed and presented target antigens on the surface of infected P815 cells. This is consistent with the induction of a Thl response and protection from vaccinia virus infection in mice immunized with this formulation. This quality of effector T cells is important for peripheral viral infections, where protection requires activated T cells to extravásate into peripheral tissues (Kundig et al., 1996). It has been shown that HCV-specific activated effector T cells homing to the site of infection (liver) were required to provide a rapid antiviral and protective response (Shoukry et al., 2003). In addition, in acute HCV infection, an early and vigorous activated HCV-specific T-cell response was associated with viral clearance and recovery (Lechner et al., 2000, Grakoui et al., 2003). Although induction of strong anti-HCcAg.120 cellular immune responses may be important for protection in immunized mice, additional experiments are needed to precisely define the role of CD4+ and CD8+ responses in this observed protective immunity. Recombinant proteins usually fail to induce significant immune responses unless given in strong adjuvants (Singh and Srivastava, 2003). Such adjuvants may enhance immune responses mainly via two mechanisms: prolonged antigen presentation due to a depot effect and activation of antigen presenting cells (APC), in particular dendritic cells (Medzhitov and Janeway, 1997). On the other hand, VLPs can induce strong immune responses in the absence of adjuvants (Lechmann et al., 2001). Due to their particulate nature, they may efficiently reach the MHC class I pathway in vivo and induce CD8+ T cells or CTL responses (Morón et al., 2003). However, cellular immune responses induced by VLPs in the absence of certain adjuvants may fail to induce immunity against recombinant vaccinia challenge (Storni et al., 2002). In this regard, a preceding work provided evidences that for induction of protective T cell-mediated immunity (using a recombinant vaccinia virus model) antigen had to be presented for extended time periods by activated professional APC (Storni et al., 2003). Montanide ISA888 formulations have been shown to induce strong and long term immunity (Bahnemann and Mesquita, 1987). Emulsions can have a depot effect and induce a slow reléase of the antigen as well as activate APC. Thus, this quality may provide HCcAg.120-VLPs/Montanide ISA888 formulation with the ability to induce immunity against vvCore challenge in BALB/c mice. Data shown here provide evidence about the ability of HCcAg. 120-VLPs to generate strong humoral and cellular immune responses and preferentially stimulate Thl-cell response. Additionally, HCcAg. 120-VLPs may become very powerful immunogens if applied together with adjuvants that stimulate both innate and acquired immune system. Non-clinical stability and toxicology studies with these VLPs should render important information about their future as potential components of effective vaccine candidates against HCV. Particularly, the results related with the ability for eliciting cell mediated immune response are attractive for the evaluation of these VLPs in the rational design of therapeutic strategies against HCV. Different factors including optimal dose, immunization schedule and combination with antiviral therapies are expected to influence the future of this and other potential immunotherapeutic strategies and deserve detailed evaluation. The authors thank Dr. Rafael F. Sanchez-Betancourt and Prof. Orlando J. Álvarez Guerrero for critical reading of the manuscript and for many helpful suggestions.